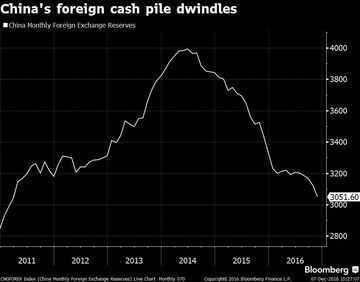 At the dawn of 2016, the dwindling of China’s massive hoard of foreign reserves sparked turmoil on global financial markets. Now, signs of accelerating capital outflows inspire little more than a yawn. Figures published Wednesday showed the value of the People’s Bank of China’s foreign exchange reserves fell by $69.1 billion to $3.05 trillion in November, the largest drop since January. S&P 500 futures, however, showed no immediate reaction and benchmark U.S. indexes then rallied to all-time highs, a stark contrast to 10 months prior, when a similar drawdown was cited as the proximate cause of carnage in global equities. One difference now is that China’s capital account hadn’t been as leaky ahead of November’s large decline; market participants had seen far rainier days from mid 2015 until early this year. Outflows averaged about $60 billion from February through October, roughly half of the amount from in the prior six months, observed George Pearkes, Bespoke Investment Group’s macro strategist. 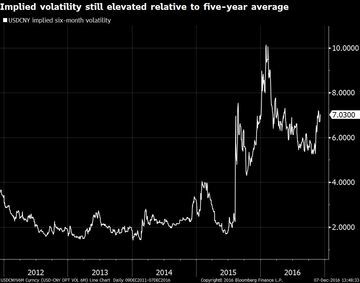 In other words, as traders have priced in a more volatile and weaker yuan relative to the U.S. dollar via the forward and derivatives markets, this also raises the bar for roiling the market through any surprise uptick in outflows. Not everyone’s convinced the sanguine reactions are warranted. “While an orderly pace of foreign exchange depreciation and an orderly pace of reserve reduction give the impression of calm, they bring to mind the image of a duck floating serenely over the water while it paddles its feet furiously below the surface,” said Kit Juckes, global strategist at Societe Generale. 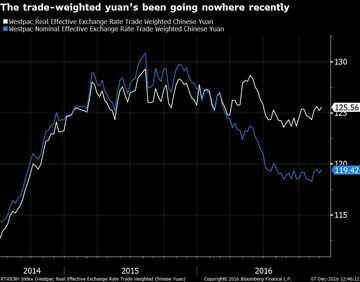 That’s probably not the case just yet, he added, citing the slow grind higher for the U.S. dollar relative to the yuan and the stability of trade-weighted Chinese exchange rate in recent months, both in real and nominal terms. Another reason for the relatively calm reaction: a mirror image of the reserve drawdown is a reduction in the net offshore liabilities of Chinese banks and non-financial corporations, said Karthik Sankaran, global strategist at Eurasia Group Ltd. In other words, China Inc. has been reducing asset-liability mismatches that it built up over the years, effectively reducing risks to financial stability. China’s outstanding net cross-border liabilities have fallen to $140 billion in the second quarter of this year from $650 billion in the first quarter of 2014, according to Bank for International Settlements data. Meanwhile, David Woo, global head of rates and currencies research at Bank of America Merrill Lynch, said that the biggest difference between this year and the last is that China has shown its willingness to use tools to control any fallout. 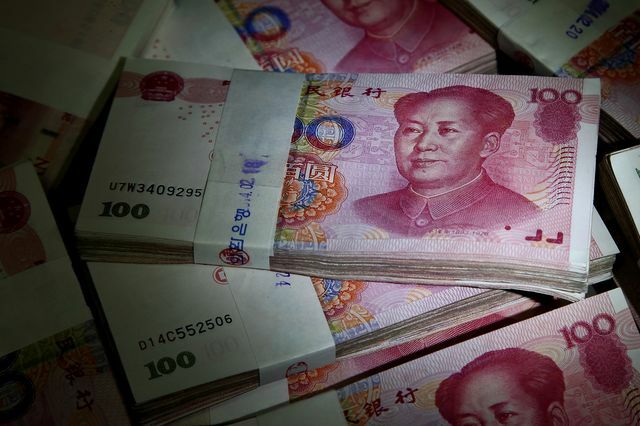 Ahead of the inclusion of its currency in the special drawing rights basket of the International Monetary Fund in 2015, China “had to be seen as loosening capital controls,” the strategist said. Policymakers now are more willing to use levers at their disposal to an attempt to crack down on capital outflows, such as making it more difficult for residents to buy insurance policies in Hong Kong. There’s some proof they’ve been successful in this regard: the sale of actress Cate Blanchett’s Sydney home fell through when the Chinese buyer was unable to get enough money out of the country to settle the deal. As such, capital outflows are now viewed by the market as a “controllable problem,” he said. But the issue with this, according to Oxford University China Centre Associate George Magnus, is that November’s outflows are proof the capital account remains leaky.